Scotland (28th October, 2013) – With over 65 years of ‘pedigree’ in the Scotch Whisky industry, leading independent Scotch Whisky specialist, Douglas Laing & Co today announce the release of their brand new Speyside Vatted Malt – Scallywag. Douglas Laing’s Scallywag is a Small Batch bottling created using only the finest Speyside Malts including – amongst others – Mortlach, Macallan and Glenrothes. Bottled at 46% alcohol strength and non chill-filtered, this Small Batch bottling has a distinct rich, dark colour – extracted from the many fine Spanish Sherry Butts used during maturation. The result is a truly charming Malt with a richly spiced character fused with vanilla (from the bourbon casks used), sweet stewed fruit, Christmas pudding, dark chocolate, zesty orange and sweet tobacco. No attention to detail has been missed in creating the Scallywag packaging. Inspired by the long line of Douglas Laing family Fox Terriers, which are renowned for being sweet yet rather mischievous dogs, it was therefore felt the Scallywag name and Fox Terrier design was most fitting for this richly spiced and deliciously sweet Speyside Vatted Malt. 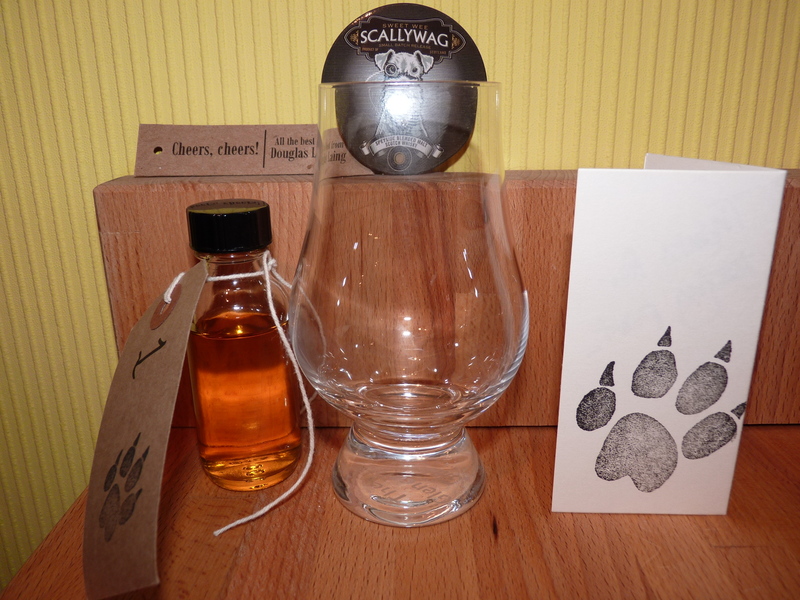 Says Douglas Laing’s Managing Director (and proud Fox Terrier owner) Fred Laing: “From a chance sketch by a designer of our sweet, wee, rascal of a Fox Terrier, our Scallywag Malt Whisky was born! “Sweet” was the key which focused us on Speyside. Its cask selection is self-evidently heavy on the sherry background, balanced by first-fill bourbon casks – so the resulting ‘Vatted’ Malt comes with an excellent pedigree”. Douglas Laing’s Scallywag will be available from specialist Whisky retailers from November 2013. Scallywag has a rich, dark colour – extracted from the many fine Spanish Sherry Butts selected. It carries a richly spiced character on the nose woven into delicious vanilla from the Bourbon Hogsheads selected. On the palate detect layer on layer of sweet stewed fruit, Christmas pudding & dark chocolate fused with spice (nutmeg and cinnamon) much of which can be attributed to years slumbering in those Sherry Butts. The finish displays a burst of zesty orange with sweet tobacco, cocoa & rich fruit cake. Blind dram #1 at the #scallywag twitter tasting event. Overall Pleasant fruit salad with a lot of oak wood, easy drinking, drying and moreish. This is a very good Aperitif whisky and probably one of the nicest blended malts I have tried so far and it is not hard to see why when you know at least a little of what has gone into this whisky. Unusually for a blended malt, this one ‘works’ very well, there is no indication of several flavours or spirits in this dram – it is all seamlessly presented as one rather complex whisky. If I was to buy a blended malt, my guess so far would be that this would have to be the one. With the price tag however I would still prefer to spend my money on decent single malts and save myself a penny or two in the process.